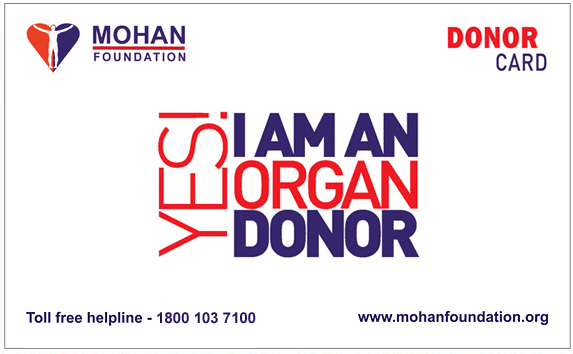 MOHAN Foundation provides you with a printable format of the Donor Card in not only English but also in Indian languages like Hindi, Tamil, Malyalam and Gujarati. Note - MOHAN Foundation will not post a hard copy of the donor card. The online donor card registered user can print their donor card soon after submission or they can print it later by using the link provided in our automated acknowledgement mail. Note:The central government has established a National Organ and Tissue Transplant Organization (NOTTO) under the Ministry of Health and Family Welfare, Govt. of India to coordinate all the organ donation activities in India. NOTTO has initiated a National Registry of Organ Donors and has requested MOHAN Foundation to send our registry to be incorporated in the central registry. 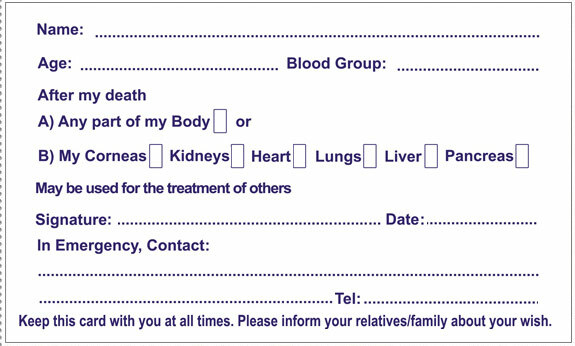 We shall be sharing the information provided by you to the national registry.